The following links will give you helpful advice on thing you need to know when buying and installing an above ground swimming pool. 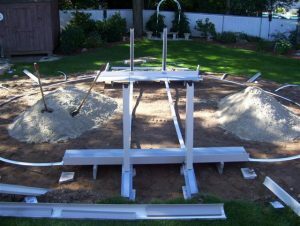 We go over things such as above ground pool placement, where the best spot is and what should I avoid in my yard. Size and shape, what is too small or large for my needs? And what can I fit. Filter systems, which type? Sand, Cartridge or DE which best fits my needs. Steel or Aluminum? What is the difference and what should I look for? And the important question! Why should you choose Teddy Bear Pools & Spas to build you new Above Ground Pool.